Between working on embroidering those two felted mittens in wool, I’ve picked up, now and then, another one of the tiny birds that I showed you earlier in the month. It’s really weird to go back and forth from embroidering with wool on something relatively large, to embroidering with a single strand of DMC on something that’s relatively small! But I kind of like the change! 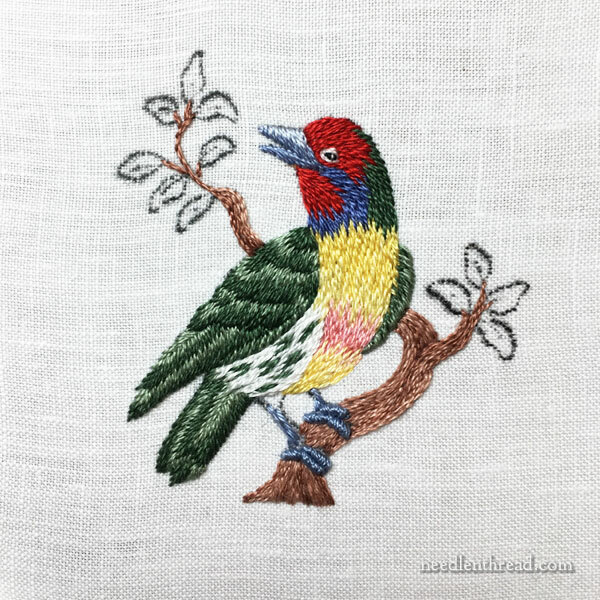 The more I look at this little fellow (you can look at the original design here, from the partial kit available at French Needle), the more I’m thinking I was a bit careless in my approach. For one thing, I was missing a color. So I just skipped it! For another thing, and I’m telling you this with a straight face – I totally winged it on the wing and on that underwing thingy sticking out. I didn’t really stop to think about where I was going or what I was doing. On the one hand, I’m glad it didn’t come out super rigid. On the other hand, I can definitely see areas that could benefit from improvement (but probably won’t!). I was a bit more conscientious of the bird’s head, because I wasn’t satisfied with the look of it on the original kit. I thought the original was a bit blocky, so I tried to blend a bit better on the head. I also reversed the color order on the eye, and substituted black. Still, the eye’s a bit smug looking. I might touch that up a bit, since the eye is always what brings a piece like this to life! A little bit about these little birds: the whole image is about 2.5-2.75″ high. They’re stitched with one strand of DMC on super-nice linen (the design is already transferred). They’re definitely projects for someone looking for a challenge, but they aren’t overly difficult. You’ll need to know a little bit about long and short stitch and you’ll need to be able to make certain decisions (like stitch directions, when colors should change, and whatnot). The picture, though, serves as an adequate guide. These birds hail from the images of French naturalist George Leclerc, Comte de Buffon (1707-1788). You can actually find many of his works available online through internet archive, including this book which includes many of his birds, as does this work. So, that’s my bird adventure – the bird in between in the mittens! I’ll finish his little legs and leaves at some point this week, along with those mittens. I hope your week is clipping along at a wondrous and happy pace! The bird in between the mittens is lovely I like the colour threads you have chosen. I definitely prefer your version of the miniature bird then the original one shown on The French Needle, your version is more realistic and beautifully stitched and he looks a happy chirpy fellow. Thanks for sharing the miniature bird with us and for your thoughts on the project. I agree with you about the “blockiness” of the bird’s head in the original. For what it’s worth, my opinion is that your bird is much better executed (well, maybe not the “evil” eye!) than the other. Your feathery stitches looked much more realistic, and the beak and feet looked much neater. Oh well–my two cents. Have fun! LOL! You could be right, Denise – I’m pretty sure he was laughing at me, anyway! I like his eye – to me he looks like he is planning some mischievous prank! Your birdie is lovely, Mary, much nicer than the one on French Needle! Your colors blend nicely into each other, it looks much more naturalistic, especially the whole wing-thing. And this time his little legs are excellent done – that’s how bird legs look like! Um … yeah … the eye looks a bit spooky indeed 😀 , but I have to admit that it adds character to the little fellow. Looks as though she wonders what to make of the beholder, she definitely doesn’t trust him … *lol* By the way, the lacking color isn’t noticeable at all. Thanks for sharing! I do agree that this bird lacks some of the finely detailed, realism that is often found in needlepainting, but I truly like the more stylistic look. After all, our needlework is ART, so we can present any interpretation that we choose. Your stitching is far superior to what is shown on the kit. The shading on the beak is well done, as well as the head and the claws. He’s quite sweet. Nothing wrong with that eye – birds frequently have a kind of smug or I-know-what-you-did look! This is such a cute project – thank you for sharing it! Oh! I love this little birdie :). The colours are so vibrant and his expression is just the right kind of cheeky 🙂 And I think you did great on the wings. I can’t say I’m a fan of the design even though I usually like birds. For such a large bird the tail is very short and the whole thing just looks odd and not quite proportional. I’d move the pupil up and left for a little less “wait till you see your windshield” look. On a different note, thanks for the reference to Buffon. I started looking at your first reference. This has been very enjoyable. On starting to look at your second reference and reading some of the information about Planches enluminées d’histoire naturelle, there are about 1008 plates; I don’t think I’ll be looking at all of them. Previous Previous post: Embroidered Wool Mittens – One, Anyway!